What started as a normal thing, a blogger writing a personal review of a newly opened restaurant, suddenly escalated into online drama when the restaurant manager threatened with a lawsuit. 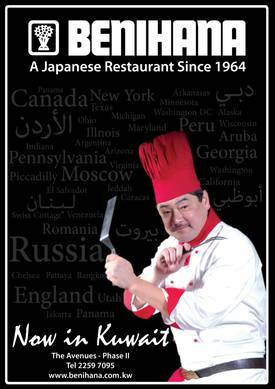 Mark Makhoul, a Lebanese expat-blogger in Kuwait, wrote a review of Benihana Kuwait, on his blog 248am . Mark said the food was disappointing and described how bad it was in detail. This angered the general manager of the Kuwait restaurant, Mike Servo. He made several comments on Mark's blog and issued a threat of a lawsuit, which was delivered only days later to Mark (see it in Arabic  and in English ). Not only do Beninhana Kuwait seek compensation of KD5001 (about $18,000) for damages, but they also request for the Ministry of Information in Kuwait to shut down the website. The topic is trending on Twitter in Kuwait #BenihanaKUW  and there are pages on Facebook to protest their actions, like Boycott-Benihana-Kuwait . Of course there is no arguing with the right for anyone to bring lawsuits if there is a direct harm from a person or entity, but the lawsuit against Mark step on not only on the basic principles but the most basic human rights guaranteed to every citizen and expat. Mark's blog is personal, he can express his own opinions about what he personally does, he doesn't represent a company that is competing with this Japanese restaurant, he reviews restaurants as a hobby, so you can't say he tried to defame the restaurant. From my following of Mark's blog I have read his restaurant review as a kind of entertainment, he is not a professional reviewer or an international chef so I can's accept all he says as absolute fact. I hope that the owners of said restaurant withdraw their lawsuit against Mark. What he said is his own opinion, be it right or wrong, and if his opinion is followed by many people that doesn't mean he is the last and only review for your restaurant. The restaurant is a local franchise of the international restaurant chain Benihana . US blog BoingBoing  called the COO and Executive Vice President of Benihana Tokyo who said he had not heard about the lawsuit.